I went to Christmas on Easter for Sunrise Service. I arrived at 7, just as the park was opening. There was no one there to greet me or hand me a bulletin. There were no pews, no organ, no minister. But there was a hawk sitting atop a telephone pole watching as I parked, a snowy egret nodding as I passed, a choir of harmonious birds singing hymns of nature and evidence of god everywhere. I am at the Orlando Wetlands Park in Christmas, Florida. I may have mentioned it here a time or two. As I have meandered in and out of organized religion, declaring myself “spiritual, not religious” and trod the yogic path, one thing has remained absolutely true for me; nature is my source. I have slipped away from it, much like the path to enlightenment, but I always come back. Each time with a greater appreciation, a greater reverence. This is my church. This is where I connect to all things enchanted and spiritual. I watch an alligator as he watches me, knowing neither one of us will harm the other, even though this creature has millions of years of existence under its belt and has seen the worst of humanity. I watch as ducks line up facing each other for some sort of rumble, a few of them meeting mid-air to work things out, while the others crane their necks forward and bark. A water lotus pokes the surface of the water without getting wet itself. 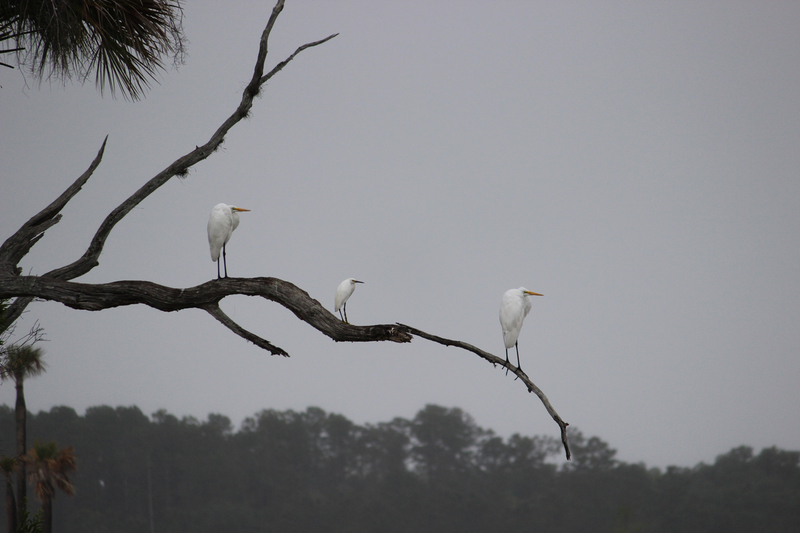 Egrets pose on the wizened finger of a dead tree, equidistant from each other, just for me. This is God, Mother Nature, the Universe. It is Christian, Muslim, Hindu, Wicca, Jewish and Buddhist. It is THE universal truth. We belong to nature. We ARE nature. Everything I have ever needed to learn, can be found here. I respect the ceremonies and traditions surrounding religious holidays, I partake in some myself, but it is more evident here, to me, that we are each a cell in the cosmos of Oneness. It is the wind, the scent of flowers, rain and muck. It is the birdsong and deep-throated croak of the alligator. It is my participation in it, my being witness to it, that strikes a reverent chord within me and reminds me of my divinity. This is my sanctuary and today’s sermon, like so many before it, teaches me to be kind, to love my neighbors and to hold EVERYTHING sacred. And on this Easter Sunday, I am not alone in my gratitude. The parking lot here, like most churches, is fuller than usual. Red rover? Rumble? Fight club? So often I see the little guys, so it was a huge treat to spot the big boy. Pink birds are just special. Roseate spoonbill. Contemplative ibis. Probably wondering where his other foot has gone. Thank you. If you haven’t been there, I highly recommend a drive out there. Thanks for reading!